When Katrina Kaif saw Neetu Kapoor coming out of the lift, she was taken aback and rushed back into the sports bar to avoid the awkward face-off. Katrina Kaif and Ranbir Kapoor once dated but their relationship went kaput a couple of years later. 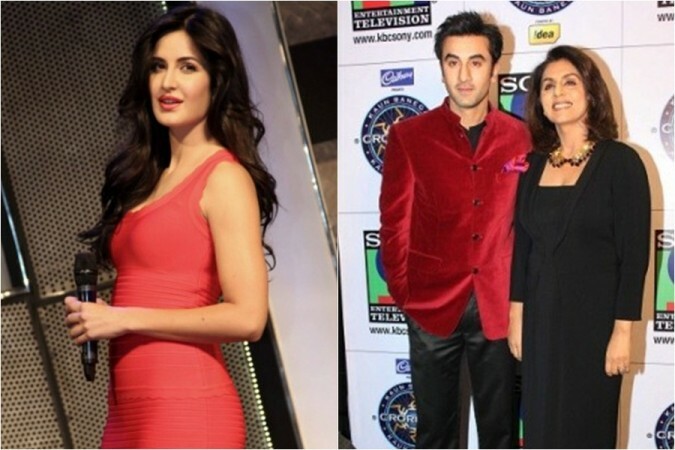 It is believed that Katrina felt insecure due to Ranbir's proximity with his ex-girlfriend Deepika Padukone. They were also rumoured to tie the knot when Ranbir left his parents' home and moved to a separate apartment with Katrina. But things went awry between the two and they parted ways. While Ranbir continued his friendship with Deepika, Katrina seems to have burned all the bridges with him. If a report in Spotboye is to be believed, Katrina recently avoided bumping into Ranbir's mother Neetu Kapoor at a restaurant in Mumbai. It so happened that Katrina was apparently rehearsing for her performance in the upcoming Dabangg Tour at a popular sports bar. Suddenly, Neetu Kapoor along with her friends Reema Jain and Laali Dhawan, mother of Varun Dhawan, visited a restaurant in the same building to grab a bite. When Katrina saw Neetu Kapoor coming out of the lift, she was taken aback and rushed back into the sports bar to avoid the awkward face-off. "Not very sure if Neetu noticed Ranbir's ex-flame but Katrina did see Neetu walking her way, and she quickly changed tracks, to avoid bumping into her," an eyewitness was quoted as saying by the entertainment website. According to the report, Katrina even asked photographers to not click her pictures and hurriedly left the venue. It looks like Katrina is still holding the bitterness of her relationship with Ranbir and his family. Katrina had expressed her fear of getting married to Ranbir in an interview to GQ in December 2015. "My greatest fear is that if and when I get married and I am standing at the altar or the mandap, he (Ranbir) may not love me completely. That he may not know his mind well enough to be making those commitments. The anticipation of heartbreak is my only fear," Katrina had said. When Neetu was asked about Ranbir's split with Katrina, she retorted and said that she has nothing to comment on the matter as it was their own lives.